The pioneer Malayalam television channel Janam confers Global Excellence Award to Keralites across the globe who have made remarkable contributions in their field. Mr. N. K. Ramachandran Menon, Chairman of Bhavans Middle East, received the award in recognition of his outstanding contribution in the field of education in the Middle East. Indian Educational School, Kuwait was exuberantly elated to celebrate our Chairman’s achievement of winning the Global Excellence Award for his remarkable contribution in the field of education. On behalf of the student community, three of us, the members of the Supreme Council of Indian Educational School, Kuwait, Aaliya Sageer, Pavana Radhakrishnan and Pallavi Veena Rajkumar spent some quality time with Mr. N.K Ramachandran Menon, Chairman, Bhavans Middle East. The interaction with this visionary will dawn on anyone the actuality that it is not just the school under his patronage that is different but the countenance, disposition and deeds of the person himself. What struck us most was his charismatic grace, humility, and abounding affection with which he spoke to us. 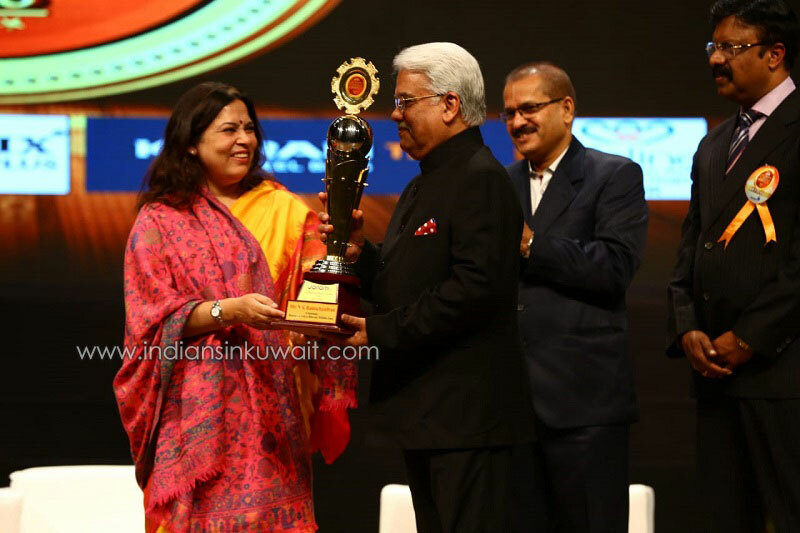 We found the same poise with which he had received the Global Excellence Award, instituted by the pioneer Malayalam television channel Janam, from Mrs. Meenakshi Lekhi MP, on January 27, 2019 in New Delhi. Aaliya Sageer: Sir, on behalf of the students of Bhavans, the IES Supreme Council would like to extend our sincere appreciation to you and we congratulate you on this magnificently meritorious award. 13 years since the inception of Bhavans in the Middle East and nearly 13 institutions. Your initiative, commitment and involvement in extending the Indian culture, values and tradition to the Indian diaspora in its true spirit in the Middle East by imparting education with a difference has been duly recognized. Sir, how did you feel when you came to know that you would be receiving an award like this? Chairman: It was actually shocking. I was not aware that people who I never knew would be probing into and inspecting what I am doing. There had been neither any discussion nor any intimation regarding this prior to the announcement. I came to know about the award only on Thursday, just two days before the award ceremony. Pallavi: While reflecting on this well-deserved award, I cannot help asking you if this noble initiative to expand quality education at the global level has been a service or a responsibility? How do you consider it? Chairman: Thank you Supreme Council. God bless you. I consider it my responsibility. Pavana: Has any of your experiences as a student, a parent or a non-resident Indian contributed to your vision to make a difference in the field of education? Chairman: It is not my experience as a student, parent or anyone for that matter. It is just the thinking of an individual. As an individual I had a vision. I took it up as my responsibility. I did not shirk from my responsibility. I made it happen. Chairman: I am yet to see it the way I wanted it to happen. It is happening but it can still improve. Students should imbibe the qualities of discipline and commitment, with the initiative to grow and to understand, not just to read and score 100% marks. If that is the only objective then the system, the institution everything is a failure. Children should be able to withstand the challenges in the world, not just to read and understand. Pavana: Sir, how do you think it can happen? Ch: Motivation from the teachers and initiatives from the children can go a long way. Life is beyond marks. Pallavi: What experiences have you garnered from the schools you have now which you would take to the next institution under the umbrella of Bhavans, Middle East? Chairman: I don’t take experiences from anywhere. I only look at what is in the present and what is tangible. Experience is based on a set of people, a situation, a time. It cannot be applied to the future which is different. I cannot reconnect past to the future. Aaliya: Bhavans Middle East Schools have the tagline, “Here every child succeeds.” Could you elaborate on that? Chairman: That is my vision. Once in my interaction with grade 12 students in 2015 it was quite alarming to hear from them that they lacked the courage to face the challenges of the world, to distinguish between fake and real people. Yes, people with whom one interacts matter a lot. Children in the gulf can be easily misled and misguided. Children have limited exposure to the world unlike those in India. Children are so confined to their little world which mostly is their own room, and safe guarded even from discussions within the family. They should be involved in discussions, they should be a part and parcel of all discussions that happen within the family. My message to the parents especially to the Indian diaspora is to involve children in all discussions that happen at home, so that they learn how to handle crucial situations and matters in future. The family is the base. The foundation is laid there. Everything should start from there. School is the extension of the family. Teachers will surely join hands with the parents to make this happen. The onus lies in the parents to guide them through involvement. Pavana: What is your next venture in the field of education? Chairman: I do not plan. I look at opportunities which are many… I look at it and take it. I don’t know what I would see but I am sure I will see something. I will take it then. Pallavi: What do you expect from student leaders like us? Chairman: Student leaders like you should be a motivation and should lead others and enable them to compete with or withstand anything and everything. Otherwise the essence of our motto ‘Preparing global citizens…” itself will whittle away. Children should not learn to confront situations in the small circle of their family or school, the growth should be beyond the confines of the school or the country they reside in. They should know the ways of the world, they should recognize the fake people and the real ones. Parents should play the key role in helping children identify people. Teachers have limitations in guiding you on that. Aaliya: Thank you very much Sir for your time. May God bless you to win many more awards. Chairman: Thank you children. Now it’s my turn to ask you. What is your commitment to your future? To the quite unexpected question, hiding our slender apprehension we spoke about our distant and different aspirations, being a psychiatrist to contribute to the deteriorating mental well-being of the present generation, to become a Chartered Accountant or to enter the film field, to become a teacher and pursue research. For each of the commitment listed there were further questions that really made us think through. However, when we finally moved out of the room expressing our gratitude, we realized that the 45 minutes talk had transformed the hazy aspirations to clearly defined achievable goals at a good clip. We left the office of our Chairman with food for thought quite resounding “If others can why can’t you?”. Interviewed by Aaliya Sageer (Head Girl), Pallavi Rajkumar (Cultural Secretary) and Pavana Radhakrishnan (Public Relations Officer), Indian Educational School, Kuwait. Success is yours always on the new ventures you take every now and then. I congratulate you on this wonderful moment of success. I was quite impressed the way the interview was conducted . Same goes for the answers given by Mr. N.K. Ramachandran Menkn the Chairman of Bavans Middle East group.